An award-winning short film, developed, produced and acted by members of Salisbury Specialist Palliative Care Services through Salisbury Hospicecare Trust, and supported by Salisbury NHS Foundation Trust. 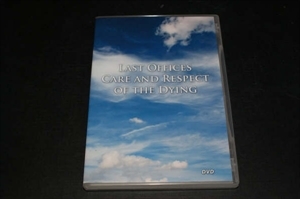 This DVD also consists of a pamphlet with 'Guidelines for Last Offices Care and Respect of the Dying'. Last Offices is the care given to a person who has died, and their next of kin. Patient care does not end with a patient's death. Last Offices provided by health care staff forms an integral part of the patient's care pathway. Death and bereavement affects individuals in a different way. Their response is generally affected by their belief, culture and religious values, and one should be aware of the importance of multi-faith by consulting with family wherever possible, to avoid offering care in a stereo typical way. The family should be included in giving that care whenever appropriate. Care should follow health, safety and legal requirements to protect both the deceased person and family, also health care workers. Verbal and written information should be clearly communicated in a sensitive manner.